It is often said that there has never been a good war or a bad peace. I disagree with this. There have been many periods of human history that have been called peaceful but which have not constituted peace worthy of the name. We must allow at least the possibility that if a short, decisive war can bring a rapid end to a peace not worthy of the name, and substitute for this something more closely approximating an ideal peace, then such a war would not necessarily be a bad thing. I am not making the claim that such a situation is often exemplified in human history (i.e., “good” wars are not often exemplified, although history has many examples of a bad peace), nor even that when such a condition obtains that it is recognizable by us, but only that it is possible that such a condition obtains. Yet to focus on war and peace as though they were polar opposites is likely to be counter-productive because misleading. War and peace are related in a way not unlike love and hatred. As we have all heard, it is indifference that is the antithesis of love, not hate. In other words, war and peace lie along a continuum, and a continuum is characterized by a smooth gradation between to opposed states. And so the complexity of history often reveals to us the smooth, imperceptible gradation between war and peace. In escalation, we have the gradual transition from peace to war, and in deescalation we have the gradual transition from war to peace. The dialectic of war and peace, unfolding as the pendulum of history swings between the poles of war and peace, yields distinct species of war and peace as the development of history forces the realization of each polar concept in turn to take novel forms in the light of unprecedented historical developments. 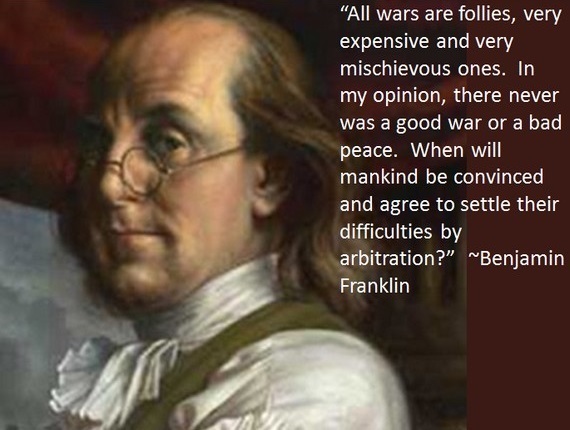 I have elsewhere argued that war is likely an ineradicable feature of civilization (cf. Invariant Properties of Civilization), i.e., the two — war and peace — are locked together in a co-evolutionary spiral so that you cannot have the one without the other. We would like to think that peace is the equilibrium state to which society returns, and in which equilibrium it remains until this equilibrium is disturbed by war, and that war is a disequilibrium condition which must inevitably give way to the equilibrium condition of peace. This is wishful thinking. Of course, if one is dedicated to this idea one can certainly interpret history in this way, but the fit between the interpretation and the facts is not a good one, and considerable hermeneutical ingenuity must be invested to try to make the interpretation look plausible. In other words, we must tie ourselves in knots in order to try to make this interpretation work; it is not prima facie plausible. This last point is sufficiently interesting that I would like to pause over it for a moment. I can remember the first time that I came to realize that history is a powerful tool for conveying in interpretation, not a vehicle for the conveyance of facts. History isn’t just an account of the past, a chronicle of names, dates, and places, that only becomes distorted when an historian with an agenda twists the material in order to make it serve a moral, social, or political function. All history, one way or another, conveys an interpretation. I came to this conclusion not from the study of war, but from the study of logic. Some many years ago I was trying to write a comprehensive history of logic, and the more deeply I penetrated into the subject matter from the perspective of the historian that I wanted to be, the more I realized that, no matter how I told the story, it would still be my story. That all history — including contemporary history — involves interpretation does not make it arbitrary or merely idiosyncratic. The best histories robustly embody the temperament of their authors, and one knows when one is reading what the author’s point of view is, whether or not one agrees with it. This is true of all the great histories from Herodotus to Braudel. One certainly could write a history of civilization in which peace is an equilibrium condition, from which war is a pathological departure, and this might well be a powerful interpretation of the human condition. One could just as easily write a history of civilization in which war is the equilibrium condition, from which peace is the pathological departure. We have histories such as the first variety, but very few of the second variety, mostly because people simply do not want to believe that war is the norm and peace a suspension of the norm. War is a mere continuation of policy by other means. We see, therefore, that war is not merely a political act, but also a real political instrument, a continuation of political commerce, a carrying out of the same by other means. All beyond this which is strictly peculiar to war relates merely to the peculiar nature of the means which it uses. That the tendencies and views of policy shall not be incompatible with these means, the art of war in general and the commander in each particular case may demand, and this claim is truly not a trifling one. But however powerfully this may react on political views in particular cases, still it must always be regarded as only a modification of them; for the political view is the object, war is the means, and the means must always include the object in our conception. This is the Clausewitzean continuum: war and peace are what philosophers call polar concepts — concepts that anchor two ends of a single continuum — and each derives its meaning from its contrast with the other. Between the two polar concepts is a graduated continuum in which one is either closer to one end or the other of the continuum, but the positions on the intervening continuum do not perfectly exemplify the polar concepts, which are sometimes idealizations never realized in actual fact. Foucault made the obvious inversion of this Clausewitzean dictum, namely, that politics is the continuation of war by other means (cf. Foucault on Strategy and A Clausewitzean Conception of Philosophy). In light of Clausewitz’s dictum on the convertibility of war and politics, Clausewitz’s philosophy of war is at the same time a philosophy of politics, and, by extension, a philosophy of civilization, as I have characterized it in A Clausewitzean Conception of Civilization and Civilization, War, and Industrial Technology. Whether or not we can transcend this dialectic of polar concepts and attain a realization of civilization that does not derive its meaning from its polar opposite, warfare, will be an inquiry for another time. This is an important corrective, though I think your argument might do well to recognize that the war vs peace dichotomy probably derives from the legal tradition that developed around modern sovereignty. Specifically, as war became a legal condition, it was treated also as a temporary state and peace the normal standard. By contrast, some tribal societies are perpetually at “war,” but the violence occurs at a lower, less concentrated level. Part of the reason Clausewitz has proven durable, I suspect, is that like Machiavelli, he stated something that is intuitively true but does not quite fit with our self-consciously developed ideas of how the world works. As you suggest, in this case, peace and war and just different manifestations of the same thing: politics. War is a way to arbitrate disputes when no other mechanism exists. Thank you for your perceptive comments, and these are points that I could and should incorporate into my exposition of the Clausewitzean continuum. The whole issue of the legal framework of war and peace — with its relations to the implicit legal framework of the international state system, and its connections to both philosophy of law and political philosophy — is a potentially fruitful area for research. The tension you note between intuitively plausible conceptions and the established ideas by which we regulate our thought — whether in the study of war and peace, or any other domain — is the heart of the matter. Hopefully I will be able to formulate my thoughts on this to the point that I can return to this subject and illuminate it with the kind of correctives you suggest.